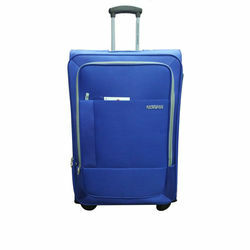 Make your journeys convenient and stylish with this elegant, spacious American Tourister Malta Soft Trolley. This elegantly styled soft trolley features one main compartment and two front pockets to offer ample space to keep all your clothes and other valuables safe and secured. This classy travel trolley is fully interlined with additional inside pocket, giving you additional space to store your excess luggage. This bag is made from premium 600D polyester fabric to offer longevity and durability.